I mixed all the ingredients together and let the mixture sit in the fridge for an hour for "flavor melding". I thought of making meatballs as my husband usually has afternoon events at work on Friday and hence only wants snacks at night. So I thought I will have meatball spaghetti for dinner and my husband can munch on the meatballs. But as he didn't have any events tonight, I simply cooked a big pan of spaghetti and tossed the meatballs in some ready-made pasta sauce - dinner served! 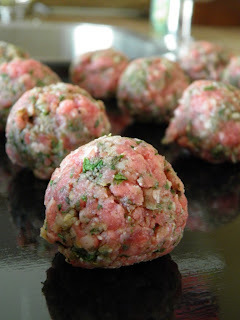 These meatballs were super garlicky, so I would recommend using 2 garlic cloves instead. 1. Heat the oven to 205 degree C. Lightly grease a sheet pan with olive oil. 2. In a large mixing bowl, mix all the ingredients well together. 3. Use a tablespoon to scoop out meatball onto the greased sheet pan. Bake for 20 minutes or until light brown. I thought the same, but the meatballs were crispy on the outside and juicy inside. And it is soooo much easier to cook them in the oven, so I'll no longer fry meatballs in a pan again!